Seven Impossible Things Before Breakfast » Blog Archive » Hands Up! “Hands up” is a phrase familiar to anyone paying attention to racial discrimination and the Black Lives Matter movement here in the U.S. In her debut picture book, Breanna J. McDaniel takes that phrase and turns it on its head. Hands Up! 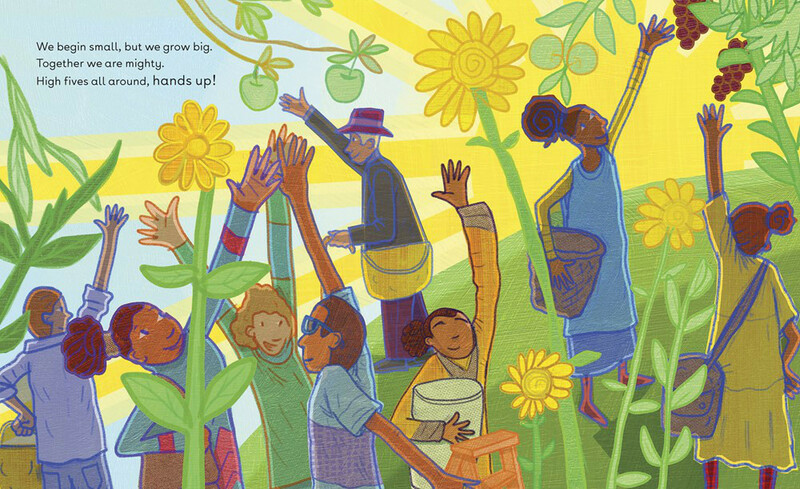 (Dial Books for Young Readers) — illustrated by Shane W. Evans and on shelves now — is about one young brown-skinned girl moving through her day and the many times she raises her hands for reasons of joy and family and community. “Greet the sun, bold and bright! Tiny hands up!” the book opens. 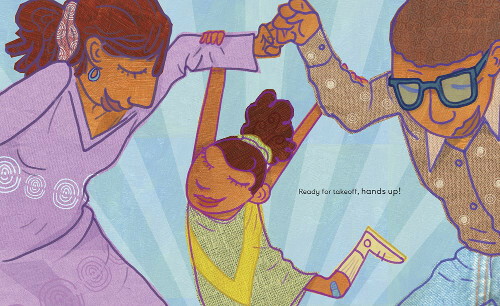 On each spread, the girl raises her hands — to stretch high, to be swung between her parents’ arms, to get the teacher’s attention in class, to sing a song of praise in her church, to take a shot on the basketball court, and much more. Evans infuses the book with light; there are vivid, exuberant yellows, reds, and oranges here, as well as warm greens and blues. It’s a palette that sings with cheer. For many people, the phrase “hands up” brings forward difficult emotions like anger, sadness, frustration, and fear. 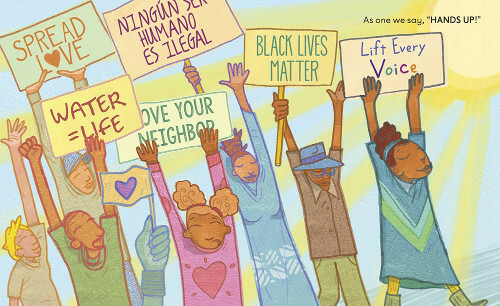 With this story, I wanted to emphasize the ways I’ve experienced that phrase as part of my everyday life: at home, at play, in church, and at protests with young people leading the way. I want the world to remember that black kids are just that — kids, people with mammas and daddies and teachers and friends, with lives full of happiness and struggle and triumph and even sadness. It’s a book that is a celebration of a black child’s everyday life, but it’s much more, as McDaniel’s closing note addresses. It’s an affirmation of self-worth and an empowering, energizing celebration of family and community. “We begin small, but we grow big. Together we are mighty. HANDS UP! Copyright © 2019 by Breanna J. McDaniel. Illustrations © 2019 by Shane W. Evans and reproduced by permission of the publisher, Dial Books for Young Readers, New York. The color palette here really is delicious and joyous. Hooray! So happy I have this ordered.